Pay no attention to sassy Frugal Hound. 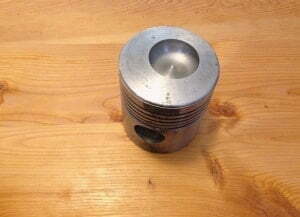 This post is about the friggin’ (by “friggin,” I mean completely awesome) tank piston. 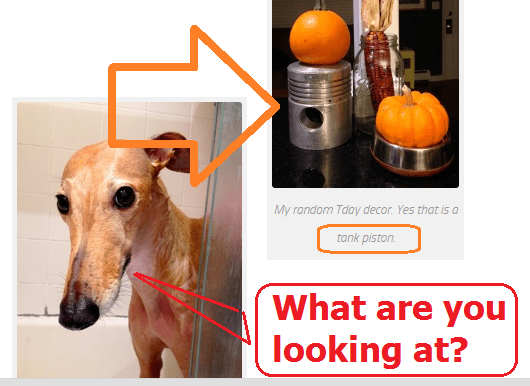 Did you see the tank piston in the picture? After I saw it, I could barely read the rest of the post. I had to know more about it. Mrs. Frugalwoods responded to my query in the comments, explaining that it was a Christmas gift for Mr. Frugalwoods. I had to know even more. The story about gift giving is a good one that makes a great counter-post to my Thursday unpleasantness. I’ll let Mrs. Frugalwoods take it from here. I once gave Mr. Frugalwoods a ‘70s-era Soviet T72 tank piston (used in Eastern Europe) for Christmas. And he loved it! We don’t exchange gifts for every holiday or anniversary, but this particular Christmas was early on in our dating career–we were still in college–and I remember really wanting to nail it and demonstrate my devotion. After all, nothing says love like a Cold War relic. Why a tank piston? Well, why not! Mr. FW has a penchant for anything even remotely mechanical or technological. Plus, as a child of the ‘80s, he’s mildly obsessed with the history of the Soviet Union and Eastern Europe generally (we actually took Russian language classes together a few years ago and dream of traveling to Russia). Thus, I knew I’d hit Christmas gift gold when I stumbled upon said tank piston at a flea market in our college town of Lawrence, Kansas. I’m a proponent of shopping used for just about everything in life (underwear and pillows aside) and gifts are no exception. A flea market or resale shop, and even the side of the road, are virtual troves of untapped gift resources. Comrades, free yourselves from the constraints of consumerism! Non-consumers of the world unite; you have nothing to lose but your debt! I had no clue what the tank piston was when I picked it up, but I knew it was a Mr. FW-type thing and, fortunately, the purveyor had included an identifying tag. I think it cost $20, which was well worth it. 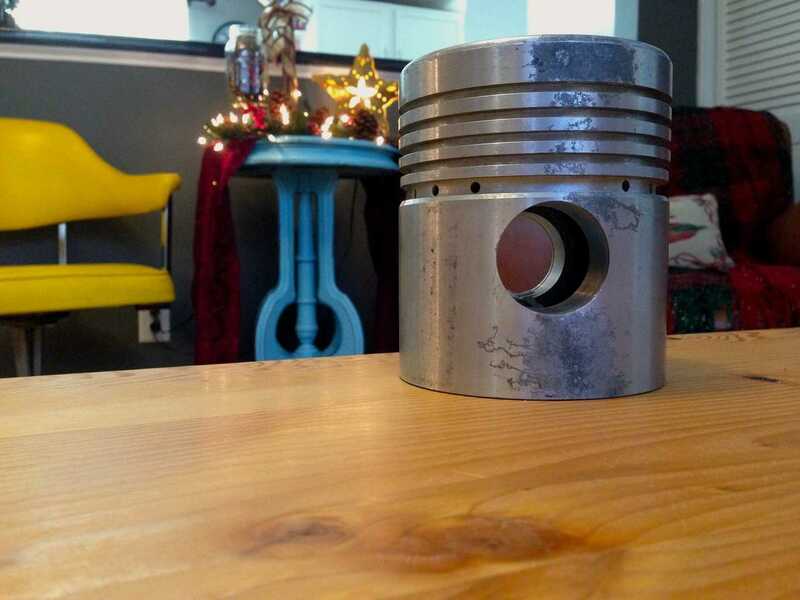 Mr. FW, of course, knew precisely what the tank piston was when he opened it and I felt like the best gift-giver in the world. I think he was pretty impressed with my insight and prowess. You see, Mr. FW is a true Renaissance man (much like Mr. 1500) and his passions span everything from ham radio to astronomy to bread baking to woodworking and I’ve always encouraged him in these pursuits—the tank piston sort of embodies his diversity of interests. One of the primary reasons we’re planning to retire early to a homestead in the woods is to enable us both to explore and pursue our myriad hobbies. The tank piston is now an integral part of the Frugalwoods home décor since I like to blend industrial steel with bright colors. 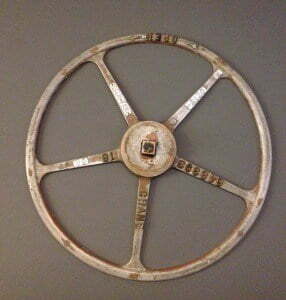 Our house is an eclectic mix of retro oranges, yellows, and turquoises along with metals, wooden furniture, and unusual decorations (we have a huge aluminum valve handle hanging on our living room wall). I will boast that Mr. FW is a superb gift giver as well—he’s perceptive, thoughtful, and seeks out things he knows I’ll appreciate. As frugal weirdos, neither of us is conventional in our tastes, nor do we buy into consumer culture, so it’s no easy feat finding frugal, unique gifts for one another. This is also one of the reasons we eschew traditional gift giving for every birthday, wedding anniversary, Christmas, veteran’s day, groundhog day… We typically discuss in advance whether or not we’ll exchange gifts so that we’re on the same page and know what to expect. Not cool to expect your partner to be a mind-reader and magically know when you’ll hope for a reciprocation gift. Personal finance sidebar–identical maxims hold true with your finances: clear expectations, shared goals, and communication always win. In the same year as the tank piston, Mr. Frugalwoods presented me with a popcorn air popper, which we use to this day. It’s the frugalist, healthiest way to make a snack and he figured I’d love that combo embodied in one practical gift. I pretty much knew I was going to marry him when I opened that air popper. 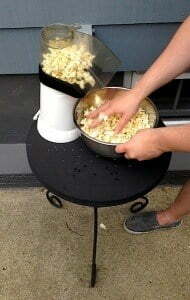 It’s a great symbol for our shared love of practical, frugal, simple, good living (and popcorn). I love the Frugalwoods’ carefree, gift giving ways. Feeling forced to buy a gift is one of the things I detest about the holidays. However, giving someone something really meaningful or useful is a beautiful thing. I pretty much knew I was going to marry him when I opened that air popper. That’s awesome! We are big flea market gifters over here as well, I’ll admit. Some of our favorite gifts have come from flea market and antique stores. They are always cooler because they take more thought and leg work to find. Absolutely! And they’re always more fun because they’re usually something the recipient does not expect in the least :). Sounds like the best financial decision the Frugalwoods ever made was getting married to each other. Even Steven recently posted…Retiring Overseas: Could It Be for You? You are 100% right! We really do consider marriage to be an important financial choice and we’re thankful every single day that we found each other. It’s awesome to be on the same financial page and to really enjoy frugaling it up. Plus, I’m seriously glad I found someone as weird as me ;). You guys are two peas in a pod, totally meant for each other! And seriously, the amount of creativity…….just wow! Awww, thanks! We fit together pretty well, for sure :). Thanks! I highly recommend an air popper! Unpopped popcorn is soooo cheap– it’s our go-to snack. No need to buy chips or crackers. I think the air popper was pretty inexpensive originally and it has lasted 10 years and is still popping strong. Finding one at Goodwill would be an even better frugal score :)! My siblings and I don’t give each other gifts. What’s the point. We’re all pretty practical. If we want something we buy it ourselves. I’ll get my nieces and nephew some low cost educational books or puzzles. My parents some good steaks and that’s it. We’re not into buying stuff just for the sake of buying it. I’m totally with you on not buying just for the sake of buying! It’s such a waste if it’s stuff people don’t actually need or won’t even enjoy. I love unique gifts that you can look back on and remember. I remember growing up and my cousin and his wife who lived down the hall in the same apartment complex brought over a giant unwrapped box that weighed about 50 pounds. Inside was every type of root beer they could find. I love root beer, not sure why the fascination, but I thought it was the greatest present ever. So creative. My wife also picked me up a snow cone machine one year, a nice industrial one off of ebay and it was awesome, we have parties all the time with our daughter and her friends. Something I would never think of but those that really know me sometimes know better than me. Love creative gifts. I got my wife an air pop popcorn maker two years ago. She loves it. I really enjoyed the tale of the soviet tank piston and air corn popper! It shows that you both strive to make each other happy through your thoughtfulness. It really takes a lot more effort to find frugal gifts that people will truly appreciate for years to come as opposed to just running into a mall and grabbing whatever seems acceptable. DH and I also don’t exchange birthday, anniversary or holiday gifts very often and we also will discuss whether we want to each year. I’m looking to own less of things that hold little value and enjoy more of the items we get a lot out of. Kassandraq recently posted…Are You Keeping A Secret? I like your philosophy of owning fewer low-value items. It’s such a misconception that more stuff means a better, more fulfilling life. I think it can often be just the opposite! And, I’m not at all surprised that you and your DH don’t exchange gifts regularly either–you two have the frugal love going on :)! Unfortunately, most of what my husband wants is brand new. Usually graphic novels or figurines or whatever. And you rarely see those used in good condition. But I tend to use Swagbucks and buy as much as possible with those Amazon GCs. I think it’s awesome that you guys find unique and cool gifts, or are okay with no gifts at all. At some point, I should start circulating garage sales again. It’s how I found an awesome Star Wars Trivial Pursuit game with all the pieces, barely used, for $10. Maybe I’d find Tim some nifty stuff he’d never have thought of. Abigail @ipickuppennies recently posted…Microwave suggestions? Garage sales can be such awesome treasure troves–Star Wars Trivial Pursuit is an excellent find! I’m with you on Amazon, so good and cheap for stuff we need to buy new. We had an air popper just like that when I was growing up. Oh the memories! I’m hungry for popcorn now! Way to go on finding the perfect gifts for each other. I love it when gifts and the things we decorate our homes with have meaning. Sometime we need a video tour of your home. I know, I’ve been craving popcorn all day too! A video tour of the Frugalwoods home… hmmm, interesting idea–thank you! Maybe Frugal Hound could be the narrator, or at least the guide (although she refuses to go up the stairs to the second floor or down the stairs to the basement, so it might be a limited tour 🙂 ). We’re not into surprises as gifts most of the time, but Mr PoP managed to surprise me for my birthday this year by hiring a landscaping guy working next door to do a quick trim to a palm tree I had been wanting trimmed for the last year or so. It’s a tall palm and he never feels safe being that high with a chain saw so had been putting me off on it for ages. Best $30 present ever – our palm looks so nice now – I am still enjoying it! That’s a perfect birthday gift–love it. I agree with you on airborne chainsaws as probably not the greatest DIY idea :). Call them antique shops/sales. Sounds way better than flea market or thrift store to a person who doesn’t appreciate that sort of thing.